Over time swimming pool tiles can accumulate a white line from the calcium hardness in the pool water. Sometimes, this can be removed by hand rubbing at it with tile cleaning blocks and in other cases, it might be too bad and shall need removing via a process called “Bead blasting”. Basically, very small grains of sand is blasted at high pressure to the tile which cleans off the calcium hardness water lines to expose the tile’s original color. It’s best to drain the pool when having this process done so that the water can be refreshed and the hardness level within it reduced. If the water has recently been drained and refilled then it could be done without draining it. In these cases, the water would just be lowered to expose the tile so it can be cleaned. 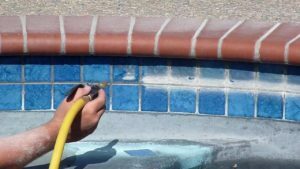 If you’re interested in getting your swimming pool tile cleaned and live in the Las Vegas and Henderson area then contact PoolStar for more information. If you’re just looking for weekly swimming pool cleaning service then we shall be happy to help you with that too! ← Swimming pool pump prime issues and troubleshooting guide.